History: 30 year old male with thumb pain. 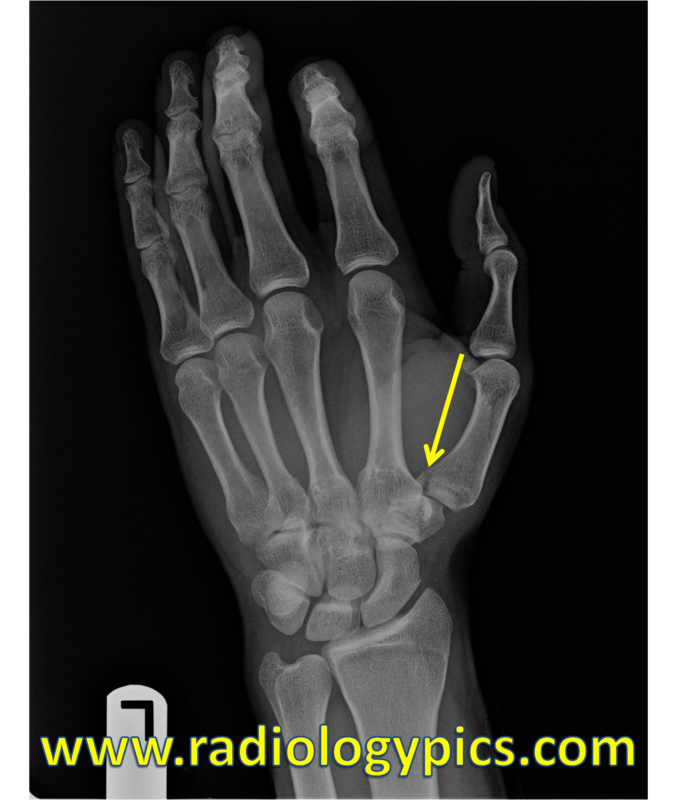 Bennett Fracture: Radiograph of the left hand reveals a fracture at the base of the first metacarpal (yellow arrow). There is adjacent soft tissue swelling. This is the appearance of a Bennett Fracture. This is the appearance of a Bennett Fracture, which is an oblique intraarticular fracture through the base of the first metacarpal with extension into the first metacarpophalangeal joint. Bennett fractures classically result in a volar lip fragment with a triangular shape. It is important to get the thumb in the appropriate obliquity to see the fracture line; otherwise, it is at risk of going undiagnosed. If more than 20% of the articular surface is involved, then open reduction and internal fixation is recommended. A Bennett fracture needs to be distinguished from a Rolando fracture, which is a comminuted intraarticular first metacarpal base fracture. These are further distinguished here.